Parents with poor diets and health issues tend to habits with their children. Obesity and heart disease is a growing concern in the U.S., and we need to understand all the risk factors. Researchers saw that parents were eating too few vegetables and consuming too many empty calories, and their children took on the same behaviors. To complicate matters, kids tend to exhibit poorer nutrition habits than parents, which magnifies health effects. The important takeaway is to educate not only kids, but parents on proper nutrition and the impacts of dietary habits on a healthy lifestyle. Fruits and vegetables are always healthy choices, but consuming seasonal produce is best, both in taste and nutrition. 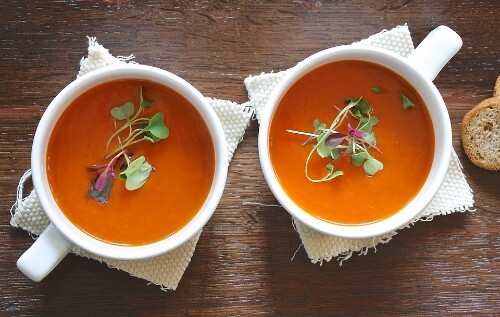 Hot summer days call for a cool, refreshing bowl of seasonal soup. In a blender, puree the tomatoes, chile, and 1/2 of the watermelon. Pour in the red wine vinegar and olive oil and pulse. Add the onion, cucumber and dill and season with salt and pepper. Puree until smooth. Pour into chilled bowls and sprinkle with dill, feta, and remaining watermelon. 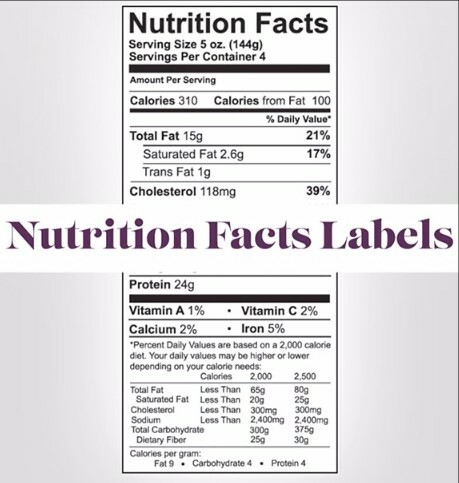 According to the FDA, a lot of research has gone into the update on the nutrition facts on food labels. Things like “added sugars”, new vitamins will be added, while “calories from fat” will be removed as research shows that the type of fat is of more consequence than the amount of fat consumed. 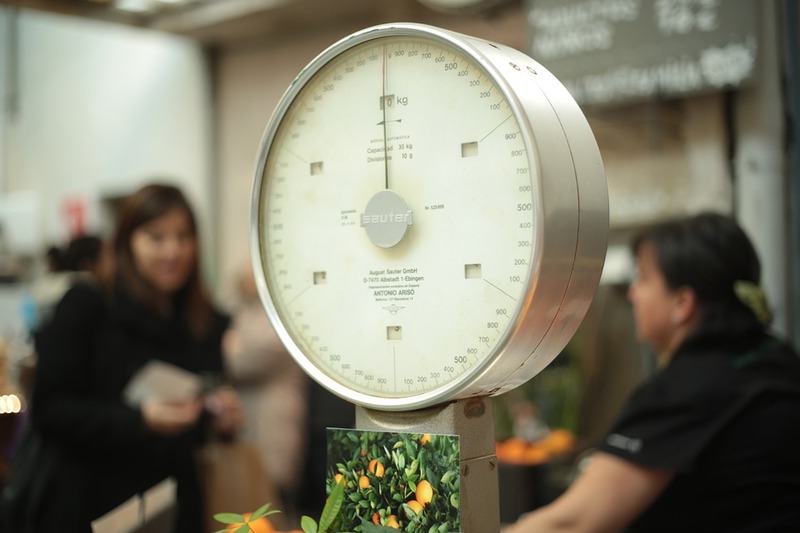 In addition, more attention to detail will go into the information provided about serving sizes. For this reason, products that have multiple servings will now have two columns, one that includes total package nutrition, and one that includes only per serving. These label changes will go into effect mid year 2018 or 2019. Did you miss me at the New York State Academy of Nutrition and Dietetics Annual Meeting? 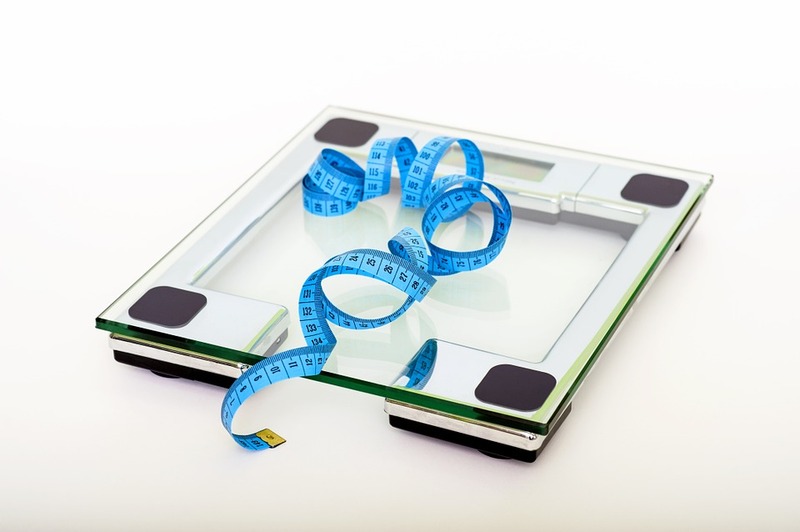 I discussed the Eating Disorders that I treat with Intuitive Eating, which include Anorexia, Bulimia (and the combination of the above), as well as ARFID, pica, and rumination. Many people are out of touch with their body’s internal needs, and would benefit from learning how to listen to its signals. Use the principles in the picture above to encourage intuitive feelings towards the body! 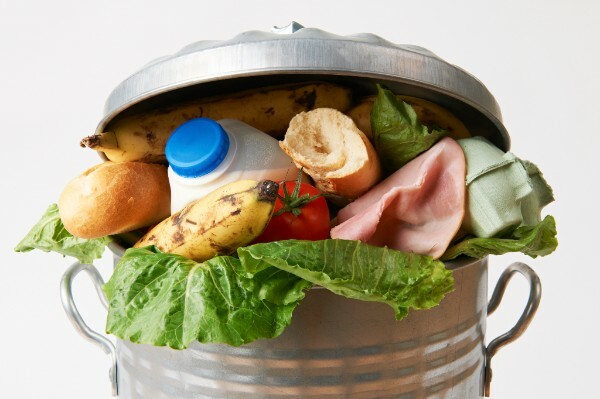 Millions of dollars are wasted every year when we throw out food. In your own home, you could be saving a bundle by making a few small changes. Shop your fridge/pantry. Before you go to the grocery store, make a list of the things you have, and try to combine them for new recipes. Save vegetable scraps like broccoli stalks, carrot tops, and herb stems (which tend to have the most flavor) in a freezer-safe container. When you have enough, throw them all in a pot, cover with water, and boil for a delicious vegetable broth. Want chicken stock? Instead of throwing out the bones of that yummy rotisserie chicken, throw that in with the veggies! Reuse your tea bags. You can resteep them at least once, and the bag and leaves are usually compostable. Track what you toss. If you add up the cost over a week, a month, or a year, you’ll likely be much more inclined to find your own methods for saving food and saving money! Fruits and vegetables are always healthy choices, and consuming seasonal produce is best, both in taste and nutrition. Bring a large pot of salted water to a boil and prepare an ice bath. 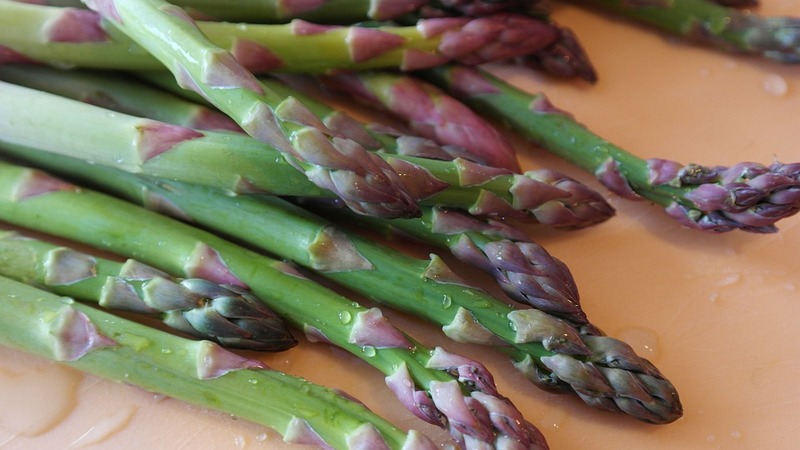 Add asparagus to water and cook until bright green and tender-crisp, about 2 minutes. Transfer to ice bath until chilled. Drain and transfer to a paper towel-lined tray. Repeat with fava beans, snap peas, and English peas. Cafefully peel outer shells from each fava bean and discard. Set all vegetables aside. Bring milk and water to a boil in a large saucepan over high heat. Whisking constantly, pour in the grits. Add 2 teaspoons kosher salt, reduce to a bare simmer, and cook, whisking every 2 to 3 minutes, until creamy and tender, about 25 minutes. Remove saucepan from heat. Whisk in 4 tablespoons butter, cheddar, and parmesan cheese. Season to taste with plenty of black pepper and more salt as necessary. Add water or milk to thin to desired consistency if grits are too thick. Grits should be loose enough to spread out on a plate slowly. Cover pot and set aside. Heat vegetable in a large skillet over high heat until smoking. Add mushrooms and cook, stirring and tossing occasionally, until well-browned on a few sides. Add shallot and cook, stirring constantly, until aromatic, about 30 seconds. Add blanched vegetables, remaining 2 tablespoons butter, lemon zest, lemon juice, and half of chives, tarragon, and parsley. Cook, tossing and stirring constantly, until any liquid in the pan is reduced to a saucy glaze. Season to taste with salt and pepper. Set aside off-heat. Stir remaining herbs into grits, reserving a bit for garnish, then divide grits between four serving plates. Top with sautéed vegetables, then with a poached egg. Garnish with remaining herbs, season egg with salt and pepper, and serve immediately. The guidelines, published every five years by the Office of Disease Prevention and Health Promotion, tackle a various topics and concerns. This edition analyzes the disparity between what Americans actually eat and what they should eat. It also includes physical activity with nutrient consumption into what is called “eating patterns”. The goal is to tighten the gap between the national nutritional recommendations and what the average American consumes. Areas of focus include sugar intake, fiber-rich whole grains, and saturated vs. unsaturated fats. The guidelines emphasize that an eating pattern, on the whole, is much more important than its parts. For the full text of the guidelines, click here. February is a time for quick and easy comfort foods! This recipe knocks it out of the park because the two star ingredients, cauliflower and leek are in season, but it freezes and reheats well. Make a big pot and put half of it away for a snowy day. 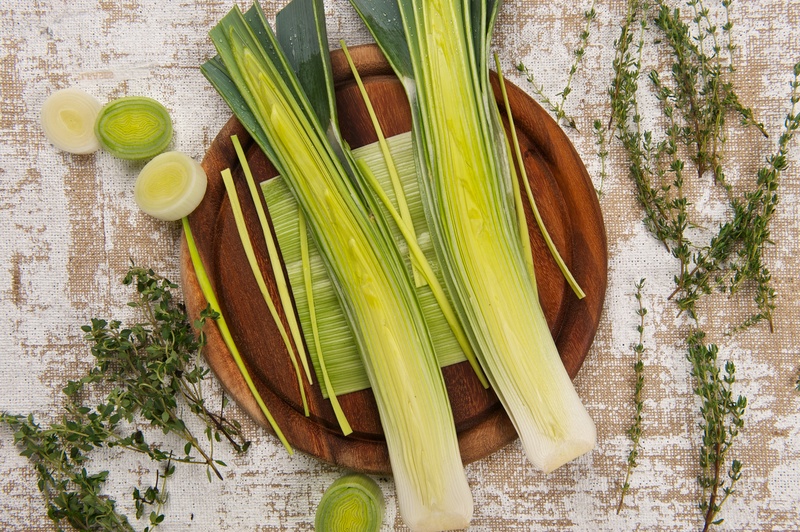 Wash leeks very carefully to remove all grit. Coarsely chop them when washed. In a medium soup pot, melt butter and add flour on low flame. Using a wooden spoon, stir and cook 1 to 2 minutes. Add broth, leeks, and cauliflower and bring to a boil. Cover and simmer on low for about 20 minutes, until cauliflower is soft. Using an immersion blender, blend the soup until smooth adjusting the salt and pepper to taste. Serve immediately. You’re about to hear some advice that no one else will give you for the New Year: Don’t, I repeat, do NOT go on a diet! 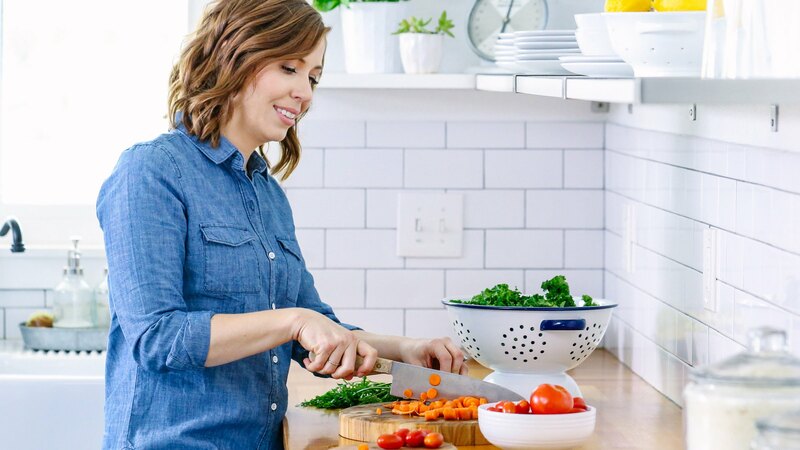 This year, instead of falling asleep while calorie counting, or beating yourself up after a big meal, forge new ways to create a healthy relationship with food. Learn to recognize and trust your body’s cues. 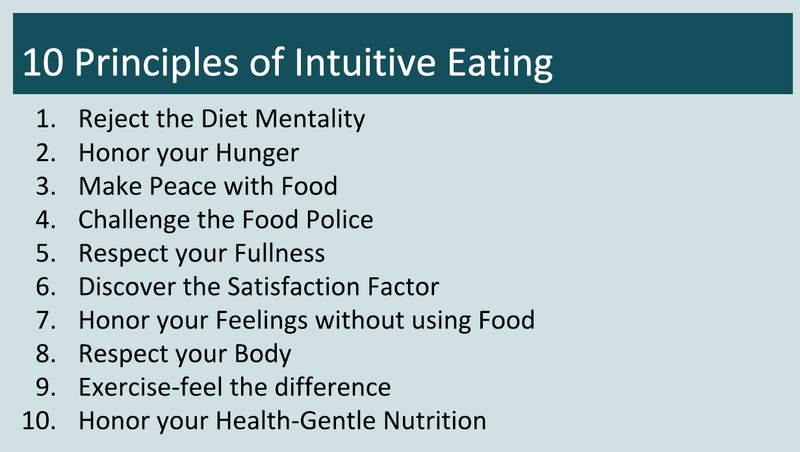 The body is designed to alert us when we are hungry, and send signals when we have reached capacity, however, in many cases, we have trainer ourselves to ignore these signals. Understand that you must be able to not only respect and respond to hunger, but also respect and respond to fullness. Be able to find comfort and satisfaction in a meal, but also explore other ways to find fulfillment outside of food. If you have police your food intake harshly, you may have found that you restrict yourself later or punish yourself with extra exercise. You don’t have to eat a perfect diet every single meal, and you can use exercise as a fun mood-booster. In the end, what’s most important is your mental and physical well-being. Bring the stock to the boil in a large saucepan. Meanwhile, heat the oil in another large saucepan, add the onion and cook on a moderate heat for 5 minutes. Stir in the rice, peas and lemon rind, then transfer the stock from the first pan into the mixture and bring back to the boil. Reduce the heat, cover the risotto and simmer for 15 minutes, stirring occasionally. When ready to serve, preheat the oven to 400°C. Mix through the three-quarters of the parmesan and season to taste with salt and pepper. Add a little warm stock if too dry. Transfer to a lightly greased oven dish and top with a combination of the breadcrumbs and remaining Parmesan. Dot with a little butter and bake for about 7-10 minutes, or until golden. You are currently browsing the archives for the Nutrition Notes Newsletter category.